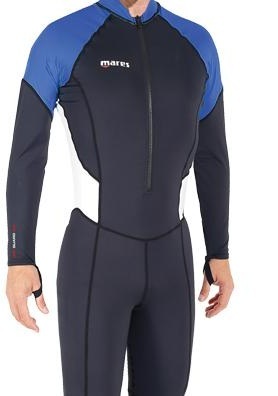 The Mares Stinger Suit also known as the Mares Trilastic steamer is designed to protect your body from jelly fish stings and sunburn. Jellys tend to be present in warmer waters and north Queensland is a hot spot for them so a stinger suit is highly reccommended when ever you are entering the water as some stingers can be deadly. Sun protection is another reason why you should wear this suit as the sun is very harsh in Australia and can burn you extremely quickly, even when its overcast so having the stinger suit will prevent this and save you skin for the future.The UV protection rating is UPF 50+ which is enough to block out even the harsh of rays and as we are all taught as children to slip, slop, slap, this suit is perfect! 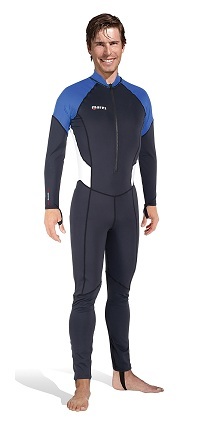 It is ideal for long snorkelling sessions as well as a first layer under your wetsuit especially when renting as you never know if the rental suits are clean. It is made from 100% lycra which makes it extremely light weight to wear and having the high stretch material means that it is super comfortable so you wont even know you are wearing it. The front sipper gives easy access in and out and the foot stirrups prevent the suit from riding up your legs. There are also thumb loops to stop the sleeves from moving also. This particulat suit is designed for males due to the way the panels have been cut and sewn together to suit the male body. To have your Stinger suit last, you will need to give it a good clean after every use, whether you have been in the pool or the ocean, you need to give it a good hand wash in water. Rinse off all of the chlorine, salt or sand and squeeze all of the water out. Then if possible try to lay it flat to dry as if you hang lycra it will stretch from the water dripping down. If you can find somewhere out of direct sunlight, this will allow it to keep its color and not fade.